"From the moment I arrived in Cairo (April 21) until departure (May1), ON THE GO Tours..."
"Eating lunch with locals and learning about the culture. But just being in egypt..."
"An absolutely, fabulously magic trip that will stay in my heart for ever. 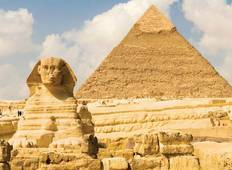 Egypt and..."
"Sameh was an absolutely amazing tour guide when I did an Felucca tour in October..."
"The tour, taken as a whole, was good; I enjoyed it." "An absolute fantastic tour We purchased with a 2 for 1 special that made the value..."
"This trip was amazing - the right amount of historical sightseeings and great cultural..."
"We had a wonderful time during the entire tour, was a great experience!" "Tour guide excellent (Shady). You could see the love he had for his country. It made..."
"thank you. fantastic organizarion of all details"
"I can't say what I loved most about this trip. At first I was astounded by how Egyptian..."
"The Jewel of the Nile Tour was everything and more than how I imagined it to be...."